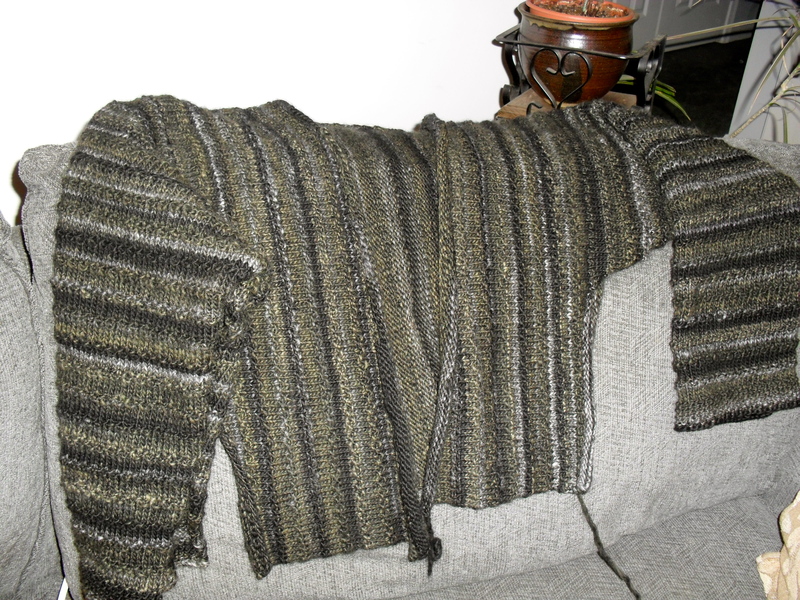 Since Rebecca is crazy busy at the moment, and I have a bit more time, I thought I’d let you see the knitting I’ve been doing since Sheep and Wool, MD. After all that spinning, I had to put the wheel and drop spindle away so as to focus on Vacation Bible School which I help run for our church each summer. Plus we went on a needed trip, and that took time to get ready for. I love the vacations, but they are work to prepare for, aren’t they?! For that reason, we only go every other year now. Plus the kids are all grown except Bethany (age 10) so we can’t get all of us together very often any more. Anyone relate?! 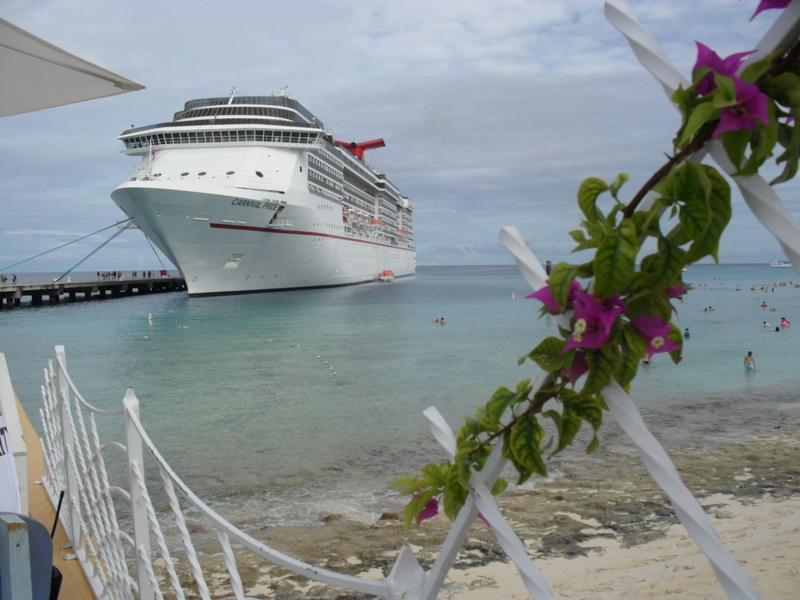 This year, we decided to go on our first cruise in 11 years….first one for Bethany. 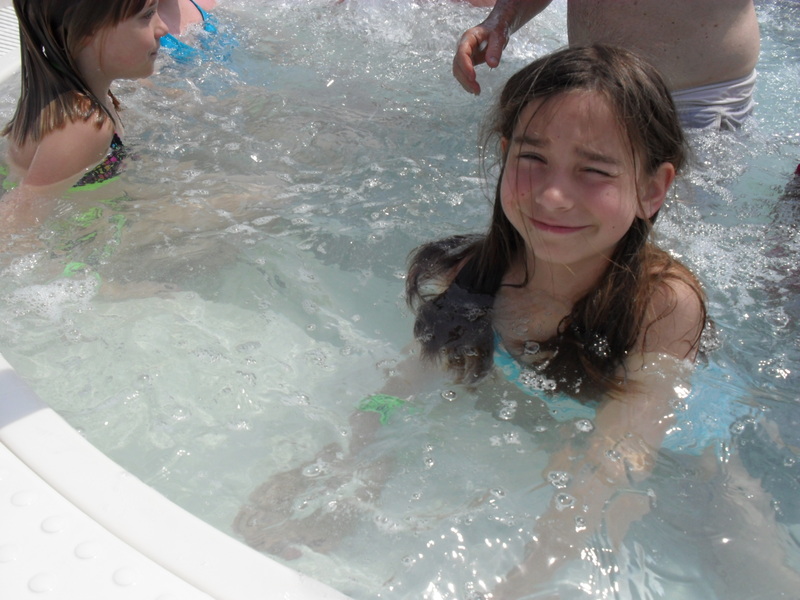 In 1999 my mom and dad took the younger 3 children plus my husband and I to Burmuda, so it was Bethany’s turn. 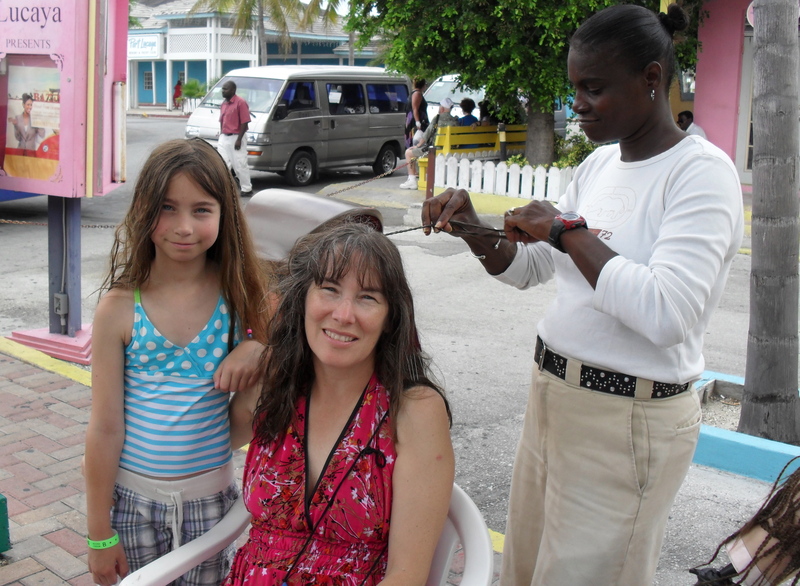 We went on the Carnival “Pride” down to the West Indies and Eastern Bahamas. 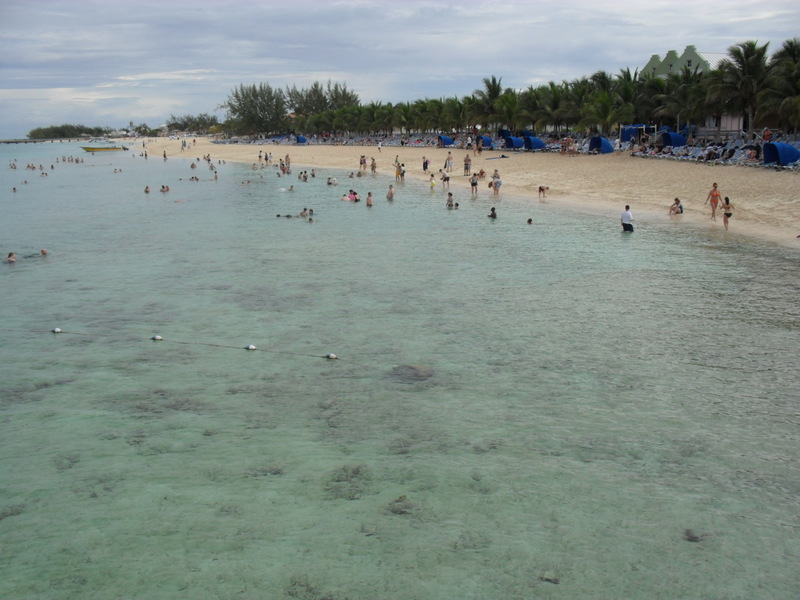 After 2 1/2 days of sailing, we visited 3 islands in 3 days: Grand Turk, Half Moon Cay, and Freeport at Grand Bahama Island. Then it was another day and a half sail back to Baltimore. Wonderful!! Have any of you cruised? It was so great to leave my car, my phone, my car, the Internet, my car…..a complete way to get away from it all! The food and entertainment were wonderful. 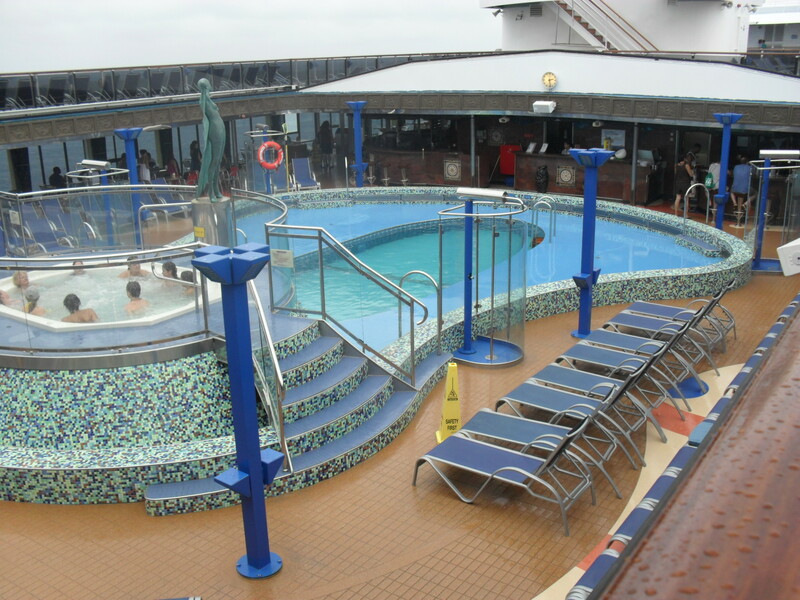 Loads of the cabins on this ship have a balcony so it wasn’t too expensive to get a cabin with a balcony. We enjoyed that a lot. We can’t wait to cruise again. Of course I didn’t leave my knitting behind. I’m working on a pattern called “Laurel Kimono Cardigan” that I got for free with the yarn I bought at Long Island on our last vacation 2 years ago. It calls for Schaeffer Laurel yarn, but I needed a black sweater and fell in love with this Berroco Jasper. It’s 100% merino wool. Beautifully spun with a mixture of whites and yellows for an INTERESTING black. I can even knit with it in dim light! I’m knitting it on size 8 needles so it’s going quickly. I LOVE this pattern because it’s so simple and fun to knit. And the results are beautiful. What do you think? 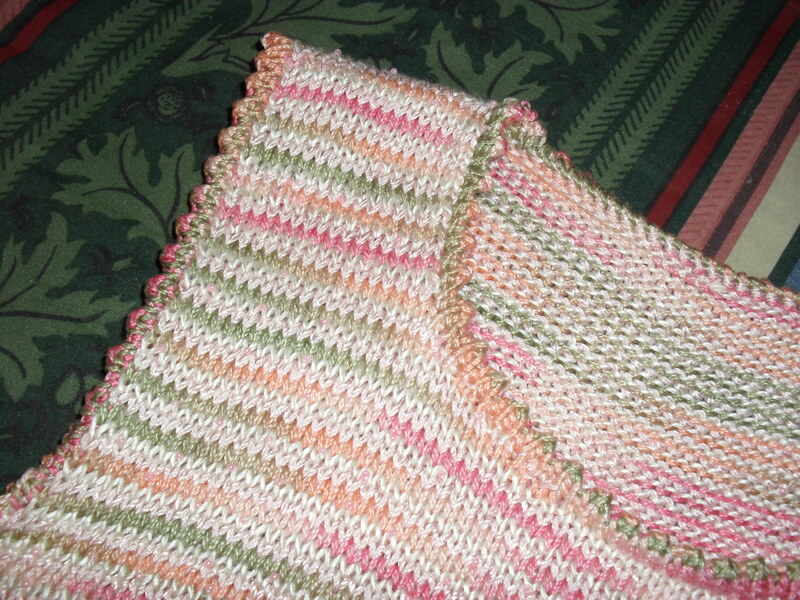 Basically the front and back are knit side ways with short rows to shape the front. 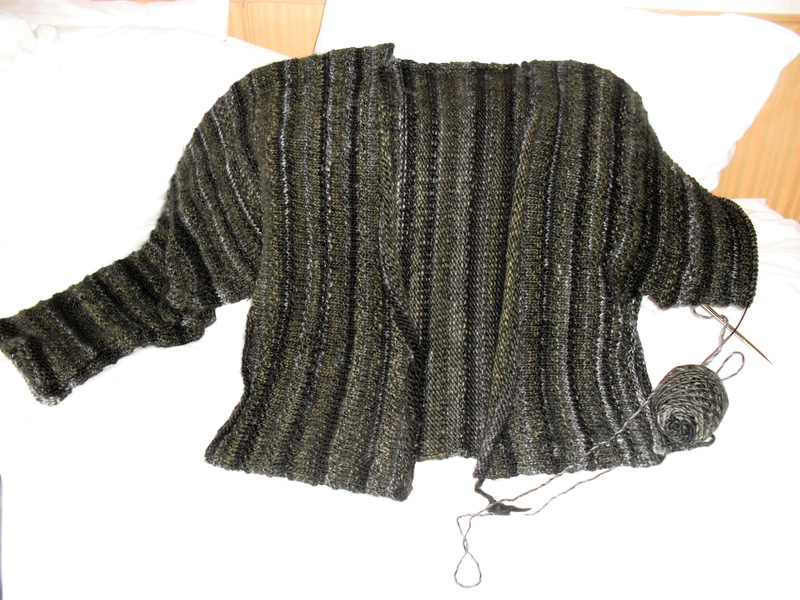 Then I attached the shoulders and picked up stitches at the top and knit down to the cuffs. I did this so I could figure out how long I wanted the sleeves. The pattern called for rather short sleeves since supposed to be a Kimono sweater. But I wanted longer sleeves. This worked out pretty well. 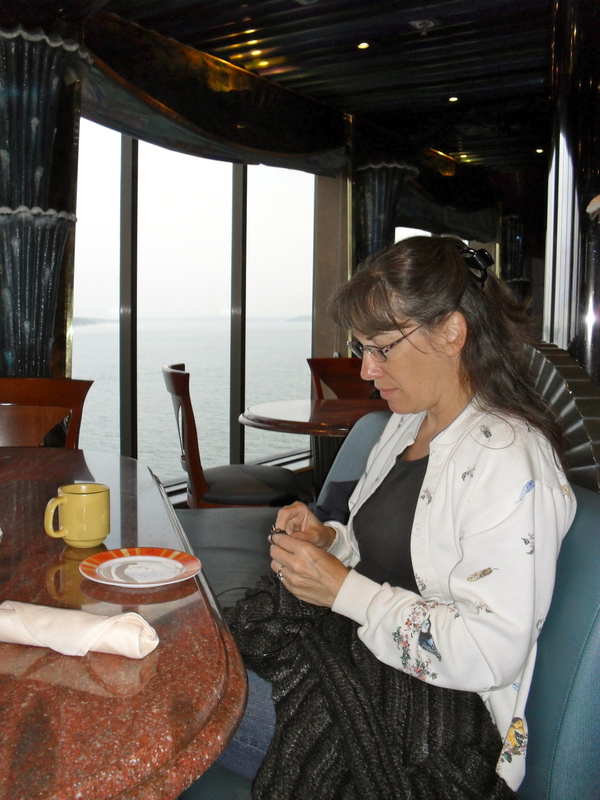 I knit both sleeves mostly on the cruise. The sad thing is that I saw NO one else knitting the entire week!! 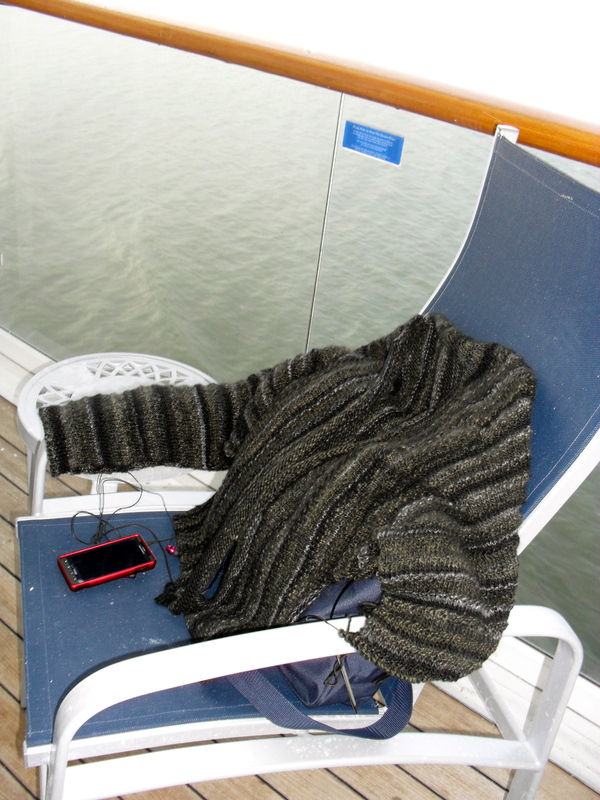 Next cruise will be a knitting cruise. Sheesh! 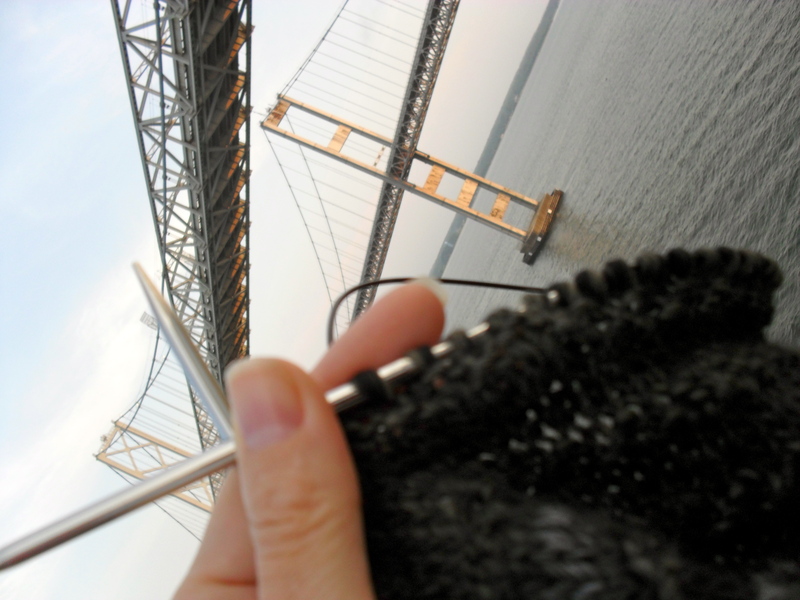 Here am I knitting as we pass under the Chesapeake Bay Bridge on the way home. It turns out it takes about 2-3 hours to disembark a cruise ship, so during that waiting time, and in a couple more hours at home, I finished the sleeves. Now it looks close to a sweater. Earlier in April I finished a summer sweater that I started last fall. 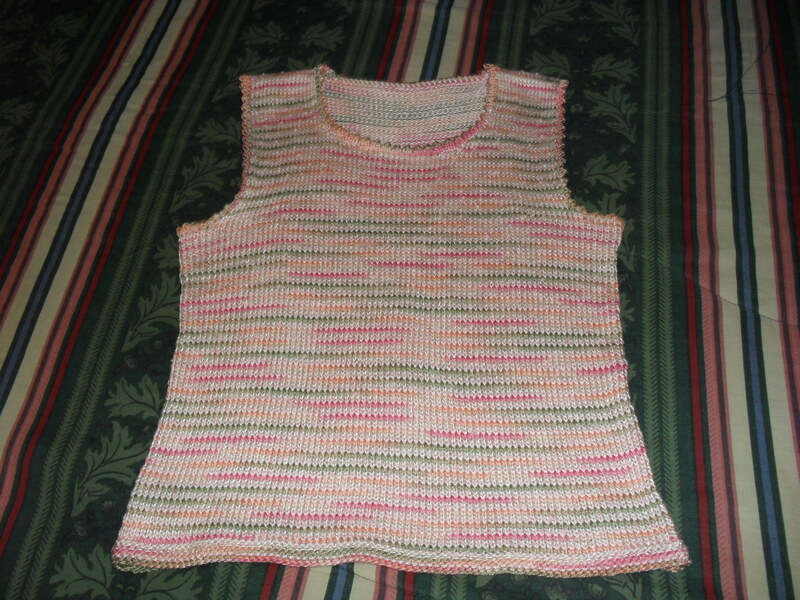 I don’t know why it took so long to knit this sleeveless shirt, but it did. It’s made from white silk Tilli Tomas strung with pink beads, a pink cotton (both bought 2 years ago) and a variegated hand-dyed cotton (bought 6 years ago on the one and only knitting retreat I went on with a shop out of Funkstown near Frederick, MD called “y2knit”.) You know how it is sometimes with your stash? You buy this yarn and it sits there……why didn’t I buy more? What am I now going to do with this? Happily, at some point when I was playing around with yarn for the “Garden Trio Tee” by Laura Byrant, I found these 3 yarns fit the bill. Yay, hooray! I did it on size 6 needles and it seemed to take forever! Oh well, leaving off the sleeves helped to finish it quicker, hee hee. The sweaters are beautiful! 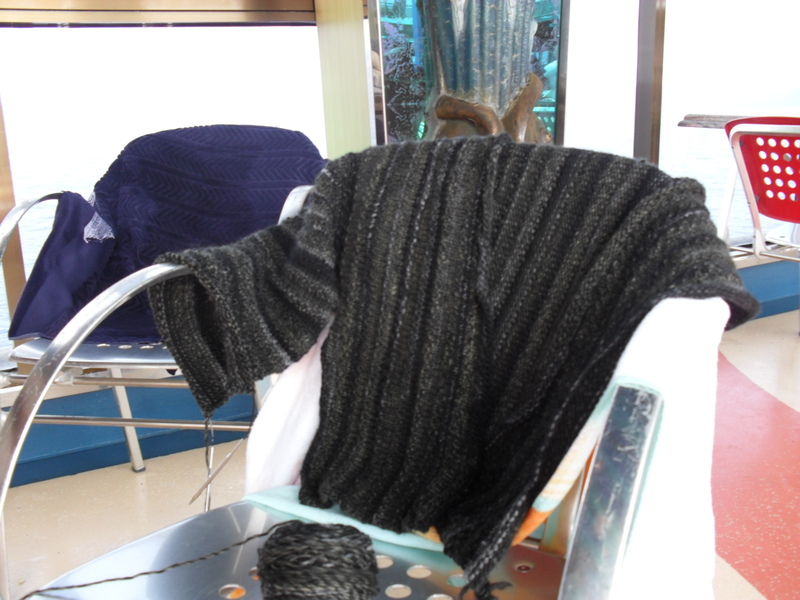 What a perfect combination – knitting and cruising. I was at my granddaughter’s softball game last night, and there was a grandmother knitting. I thought “what is the matter with me? Where is my yarn?” Perfect time and place. So from now on……. I can help you set up a cruise for your friends who knit.